Hvar city is the administrative, tourist and cultural center of the island, situated at its southern shores. This enchanting city has a very rich history with diverse cultural heritage. Over 140 years of tourist tradition helped developing Hvar into a city that satisfies even the most demanding of visitors; such a rich palette of services with simple and sincere kindness of the locals combined with the unique and untouched natural beauties will leave no man indifferent. Hvar can be easily reached by boat. Catamarans sail directly from Split to Hvar harbor; the voyage lasts an hour for a fee of approximately 7 Euros. If want to transfer your car to the island, you can board the ferry in Split or Drvenik harbor. The ferry from Split docks in the Stari Grad harbor, while the one from Drvenik docks in Sucuraj. Hvar city is then a short car ride away. Ferry ticket is approximately 35 Euros, including the fee for your car. Hvar is the city of luxurious and quality accommodation, whether you choose to stay in a five star resort or an auto camp. It is very easy to find private accommodation in numerous private rooms, apartments or leisure houses scattered all across the city. There are several hotels in the immediate city area; some of them (Park, Riva, Adriana and amphora) are four star resorts. You can stay in one of luxurious private villas, all of them four or five star resorts. And if you prefer to stay in touch with the nature, there are two auto camps: Vira and Lilly. The city of Hvar formed and started gaining its urban form during the medieval period, experiencing the ultimate blooming under the long Venetian rule. 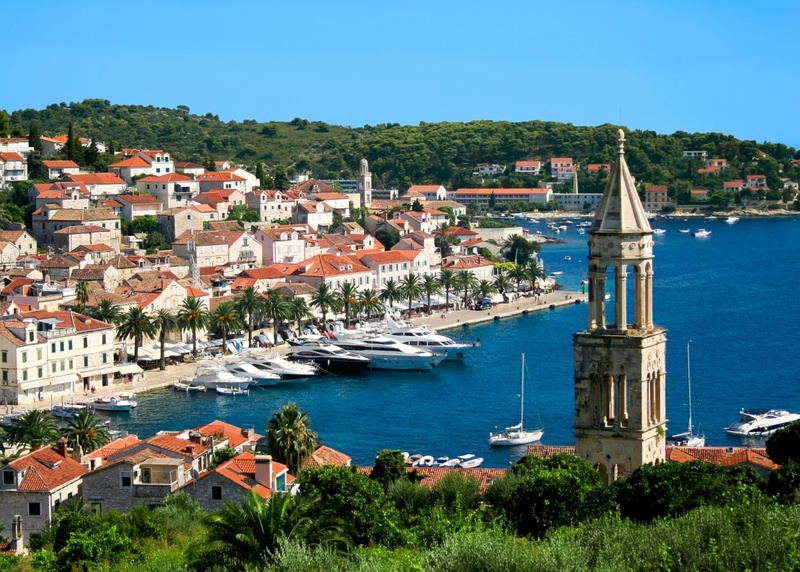 During that period Hvar was an important commercial port, so numerous important institutions were founded and built. Numerous sights and monuments are preserved from that period until the present day and are daily visited by numerous tourists. The central square of Hvar, Pjaca, is the biggest square in Dalmatia built in the 15th century. Be sure to explore the magnificent medieval city walls for the 13th century, with a 16th century fort built to defend the city against the Turkish invasions. The city of Hvar has one of the oldest theaters in Europe, built in the 16th century. One of the main reasons why most of the tourists come to Hvar are its amazing beaches. Whether you seek privacy in one of numerous hidden coves, enjoy fusing with the crowd on popular pebbly resorts (e.g. Hula Hula, Amfore) or prefer to enjoy playing with the kids in the sand (Pakleni Otoci); the bathing resorts of Hvar city are diverse enough to please all the different preferences. Probably the main reason for Hvar’s immense popularity among younger tourists is incredibly rich and diverse nightlife offer. There are several exclusive nightclubs and lounge bars (e.g Carpe Diem, Veneranda, Kiva) where you can enjoy in good company while sipping delicious cocktails and dance to the inviting summer rhythms until the early morning hours. Find information about selected Hotels, apartments and rooms in Hvar Town to choose the perfect place for your accommodation.